Tuck is a mattress company that specializes in custom engineering beds to meet your individual sleep needs and preferences. With so many details and specifics involved, it is a unique challenge to review a Tuck mattress. 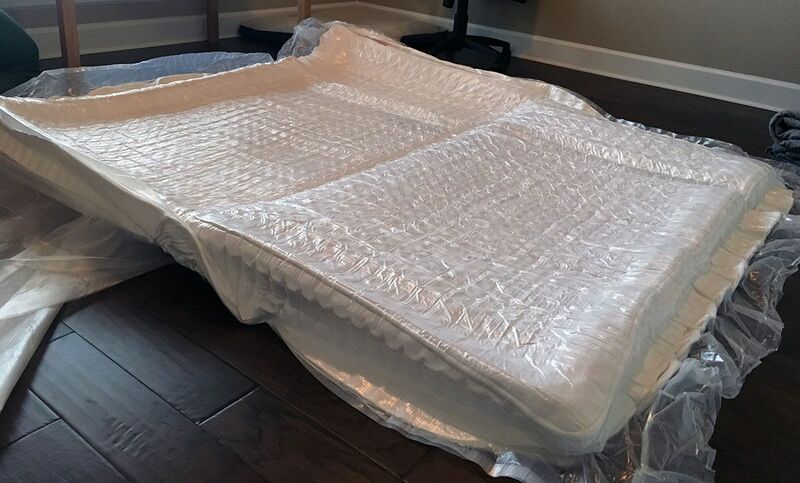 In order to give you the best idea of what to expect when you get a Tuck, I will provide you with the details and information that apply to every Tuck mattress, as well as share my own personal experience with my mattress customization. See how the customization process works HERE. Learn more about the customization process HERE. There are no weight limits with Tuck mattresses. You provide your weight in the Sleep Test and that is taken into consideration when designing your mattress. You can place the Tuck mattresses on an adjustable base, a box spring, a solid platform, a metal grid, a slatted base, or even on the floor. All components of the mattresses are made in the USA.. See more information about the materials HERE. Tuck offers free shipping and delivery in 3-5 days. There is a 100+ night trial period for you to test the mattress. It is actually 145 days, 12 hours, and 53 seconds, to be exact (no explanation about that on their website). Tuck has an 11 year, one month and one day warranty (also called their 10+ year warranty). Everyone who orders a Tuck mattress must complete a Sleep Test. This Test is very detailed and covers your personal information, mattress details, and sleep habits. 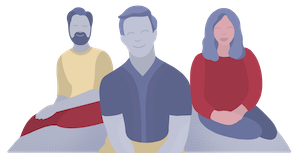 It asks a wide range of questions, from your age, weight, and body type to how well you sleep, what your current mattress is and what your dream mattress would feel like. The team at Tuck did tell me that their customization engine puts more emphasis on the factual answers to their questions – like body composition and sleep position – over more opinion based questions like what your dream mattress feels like. I want to provide you with a small summary of my sleep habits, and my husband’s sleep habits, as this information was used to create our blended mattress and is a part of the information that I used to review the mattress Tuck created. I’m 5’ 7” and average weight. I am an easily disturbed back and side sleeper. I tend to sleep slightly hot but rarely wake up in pain on my current memory foam mattress. My ideal firmness is a medium level. He is 6’ 5” and average weight with broad shoulders. He is a sound sleeper who tends to sleep hot. He sleeps primarily on his side and his stomach, snores, and prefers a medium firmness in his mattress. 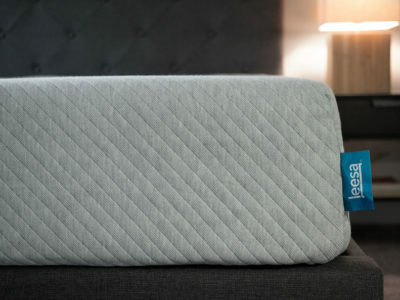 When two people are designing a Tuck mattress, they have the option to either blend the results of their Sleep Tests in one mattress or create a dual comfort mattress where each side is designed for a specific person. Since we do not have hugely different sleep preferences, we opted for a blended mattress. After you take the Sleep Test, Tuck calculates your answers and uses their specially formulated algorithm to generate a mattress. Feeling- How soft or firm a mattress feels at the top, closest to your body. Feel is distinct from support. Cooling – Degree to which cooling elements will be needed in the mattress to meet the preference of the sleeper. Support – How well the mattress presses back against you to keep optimal spinal alignment. Conforming Ability – The degree to which the mattress contours or molds to the body, creating a feeling of ‘floating’ without pressure points. Motion Isolation – How effective a mattress is at confining the movements of a sleeper. Each factor is given a scale and your results are indicated somewhere along each scale. Once again, this mattress is created as a result of our specific Sleep Test answers and Tuck’s sleep research and data. Your mattress may look similar or it may have different layers and materials. Tuck does a good job of helping you visualize your mattress components by giving you scales and ranges to understand how they made adjustments. The mattress came in a large box and delivered to my doorstep. The King mattress I received weighs more than 130 lbs, so it took two of us to get it unboxed and laid out. 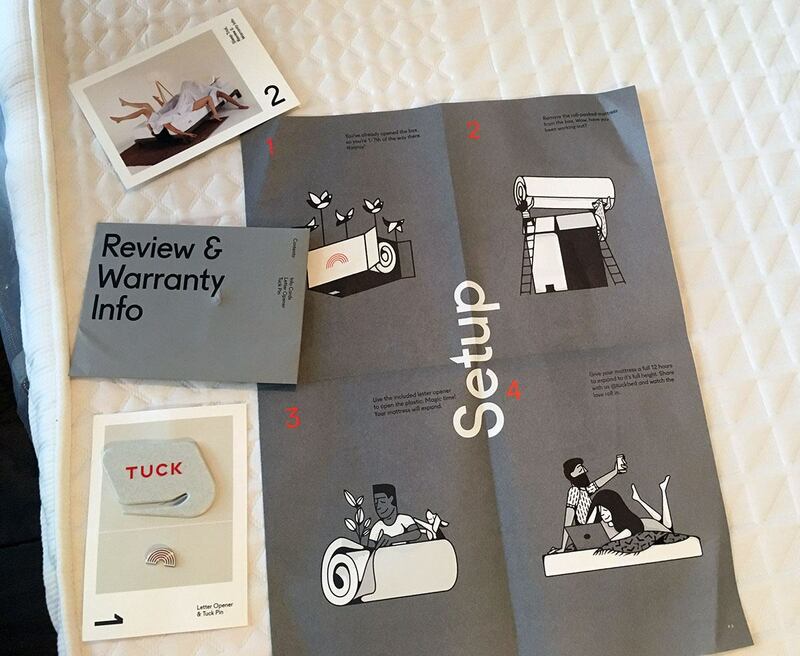 Tuck provides plenty of documentation and instructions about how to get the mattress unsealed and open, allowing it to breathe. The mattress is aesthetically pleasing, clean and white with varied textures on the surface. It does have a zipper along the bottom but Tuck does not recommend you remove it as it may be challenging to get back on. After allowing the mattress to breathe for a day, I tested the responsiveness of the memory foam layer on the top of my mattress. 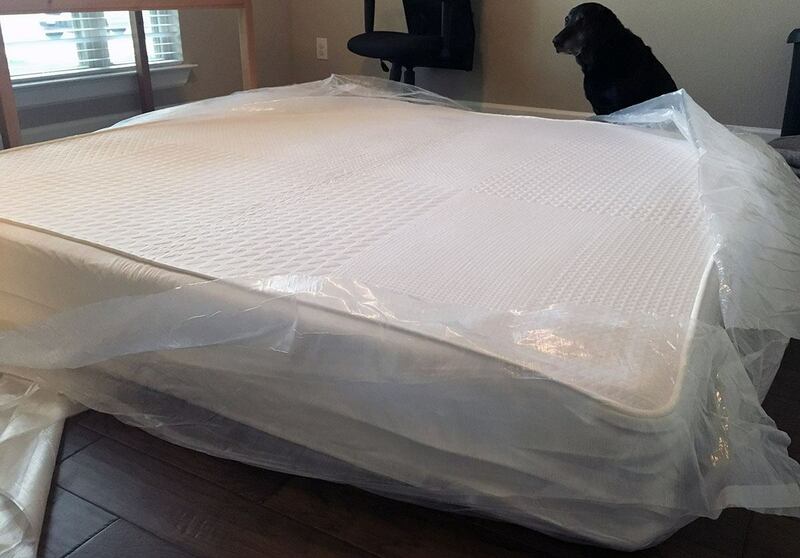 While memory foam is naturally less responsive than a spring or coil mattress, this memory foam was fairly responsive and regained its original shape quickly. In my Sleep Test, I said that I enjoyed sleeping on a mattress of medium firmness. When I first laid down on the new Tuck mattress, I sunk further in than I have on previous mattresses and was surprised by how soft it felt. With that said, I have enjoyed a comfortable and cool nights sleep for the week I have reviewed the mattress. I have had no issues with aches or pains or feeling a lack of support. And I have not been sleeping hot. Even though my mattress was a blend of the results of two Sleep Tests from two different individuals, both of us felt that all of our sleep preferences and needs were met. We both enjoyed comfortable nights of sleep – and barely felt each other thanks to the great motion isolation. Support: Tuck says they are focused on helping you find proper (neutral) spinal alignment. They take your weight, body composition, and what you consider your ideal mattress firmness when designing your mattress. Weight and body type matter in terms of firmness because a mattress will typically feel less firm to a heavier person and firmer to a lighter person. Taking all of these factors into consideration helps Tuck find the ideal firmness that supports both your specific weight and any potential pressure points generated from your body type. Conforming Ability: Your sleep position and body type are big factors is the conforming ability of your mattress. 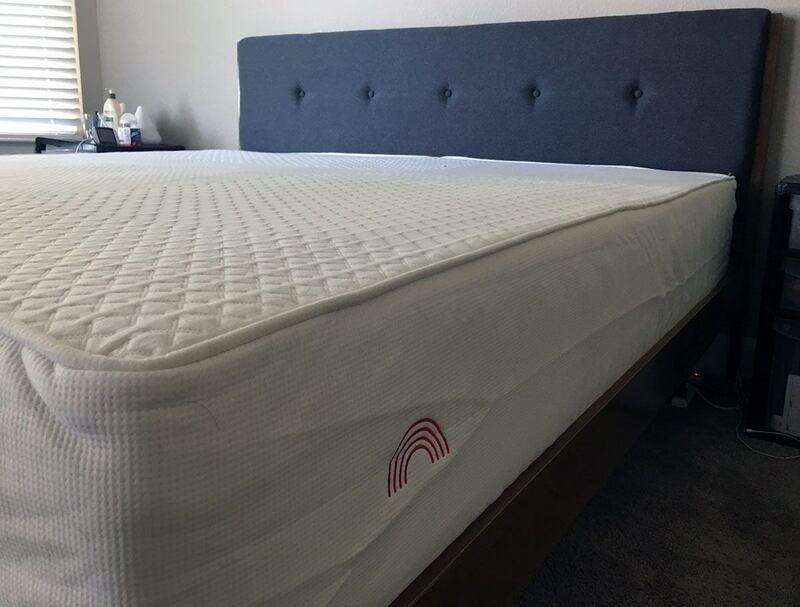 Although I (and my husband) indicated that we preferred a medium firmness in our mattress, the fact that we sleep on our sides and our body types indicated that we should have enough conforming material to help relieve any pressure points. Feel and Responsiveness: There are several factors that play into overall feel and responsiveness of the mattress. Please watch the video below to see how responsive the Tuck mattress is. Motion Isolation: This is key for those who are sharing a bed because increased motion isolation prevents you from feeling your partner moving next to you in bed and lessens your chances of being disturbed by them. 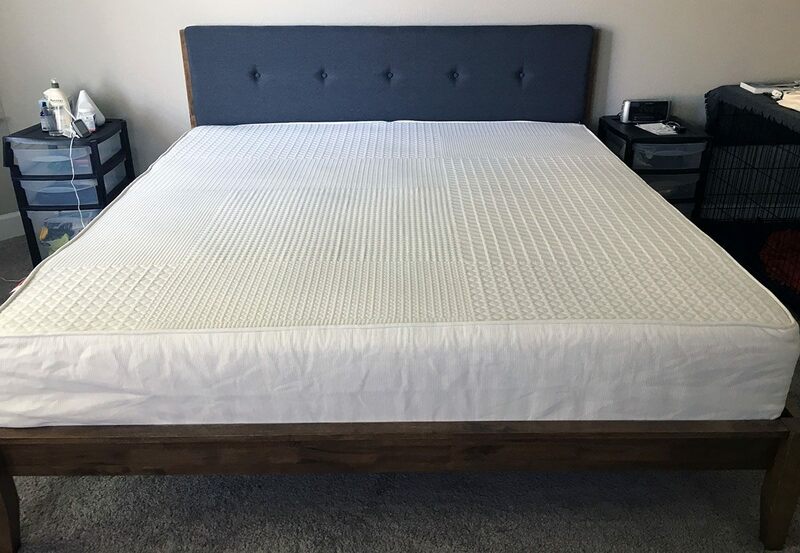 Both memory foam and individually pocketed micro coils are well known for being great at isolating motion The combination of the two make for a solid mattress for motion isolation and a good option for couples. Cooling: My husband and I both said that we tend to sleep a little hot. Tuck incorporated both Nano coils (micro coils) and a pocketed coil support system in our mattress. These are great for sleeping hot because they allow for air to flow between them (unlike foams). Our memory foam layer was also infused with copper to draw away heat. 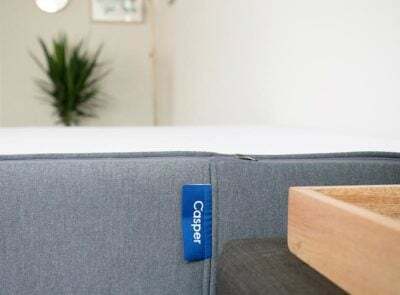 While it is a popular cooling mechanism for bedding, there seems to be a little bit of debate on whether or not copper will actually keep you cool. There are few studies to back this up but copper is a good heat conductor (think copper mugs to keep Moscow Mules cold). 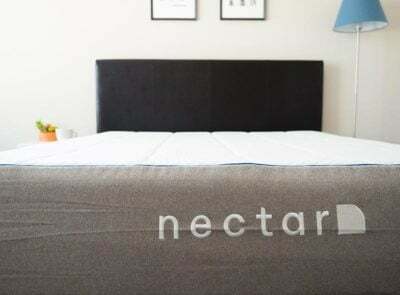 My husband and I have both enjoyed a cool night’s sleep since we got our Tuck mattress Neither of us experienced waking up hot or sweating during the night. The combination of pocketed micro coils and copper infused foam seems to have done a good job of keeping the mattress breathable. Edge Support: The edge support is noticeable with the Tuck mattress. Neither of us felt that we were close to falling off the bed. Durability: Tuck incorporated several higher quality components into the mattress that make me believe the mattress will hold up over time. Coil support system: this system is higher quality and more durable than its polyfoam alternative. Latex: Latex foam is used on mattresses made for those under 200 lbs, and is also considered a high-quality and durable material. Base and transition foams are 1.8 lb. density and typically anything over 1.5 lb is considered good. The only slight concern is the density of the copper infused gel memory foam. Typically anything of 4lb density or higher is considered great, and this is 3.5 lb. That being said, it is only slightly below the 4 lb range. For a Queen mattress under $1,000, this is a great value. You Sleep With A Partner. 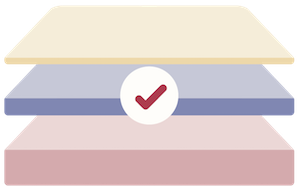 Tuck offers customization for both sleep partners and you can either choose to have your results blended into your mattress or divided by two sides. If you sleep very differently than your partner you can still both get a mattress that meets your sleep preferences. You Are Heavier– The pocketed coil support core is going to be a better support system for heavier sleepers than a foam core would be. The mattress is also a little bit thicker than average and it is customized in part by your weight and body type. You Are Looking For A Hybrid– This mattress has many different components in it. It will likely have memory foam in it, but you will not have a full memory foam feel. It has an innerspring support system, but it will have layers of foam and micro coils above it. 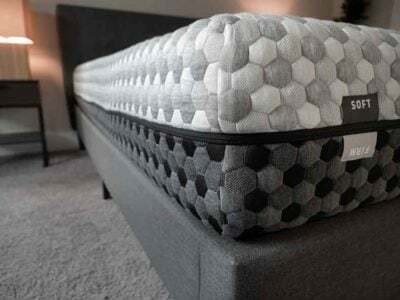 The mattress aims to utilize the best aspects of the different components used in the construction, and it will definitely have a hybrid feel to it. You Tend To Sleep Hot– Sleeping hot is a major issue for a lot of people. This mattress can be customized in a way that will sleep cool. The micro coil layers, for example, will be added to the construction to allow air to flow freely through the mattress. You’re Simply Unsure What You Want– If you just don’t know what type of mattress you want, then the Tuck could be a really good option for you. It will do all of the deciding for you and give the best-educated guess for the type of mattress you need. There’s A Particular Type Of Mattress You Really Like– If you’ve had success with a certain type of mattress, then the Tuck may not be for you (or you would at least need some time to adjust to it). For example, if you really love the memory foam feel, Tuck will probably have some memory foam in it but not a lot. The Tuck is more of a hybrid feel, so if you like a very specific type of mattress, then your best bet would probably be to stick with that specific type. You Want To Test The Mattress Before Buying It. 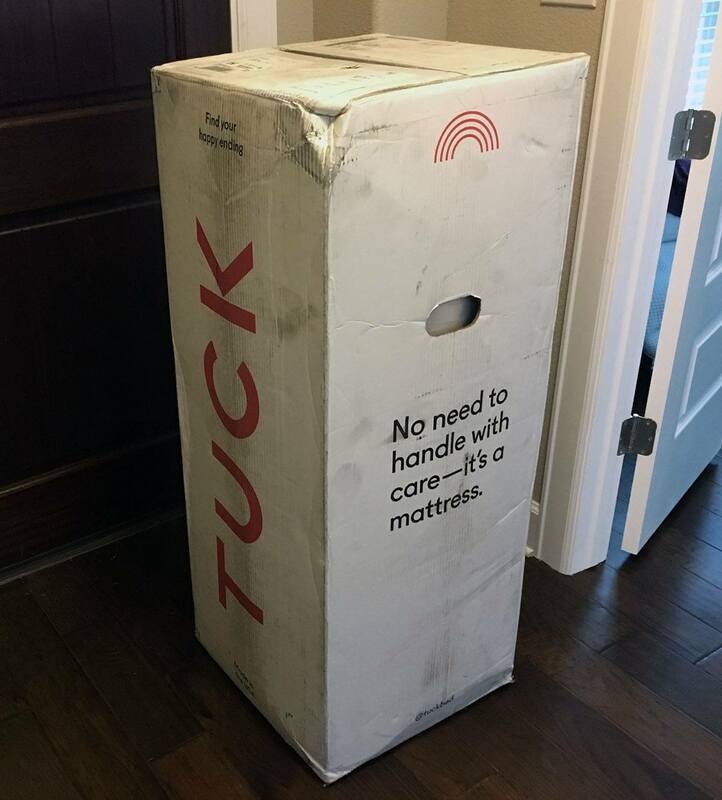 Tuck is a new online mattress retailer and the only way to try their mattresses is to order one and have it delivered to your door. It’s a new concept as well, so you’re taking a risk on an innovative idea. However, the return policy is sound, so there’s not a lot of downside in buying one. 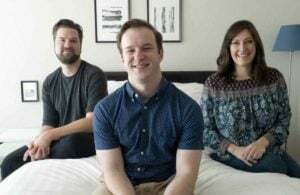 My experience with Tuck and customizing my own mattress with them was very positive. They provided great customer service and were open, transparent and receptive to all of my questions during the review process. Based on the construction of my mattress and my sleep experience, I think they used mainly high-quality materials and that the final product is a really solid value for the price range. The main takeaway from my Tuck experience is that you may think you know what type of mattress you want or need, but if you trust Tuck’s research and technology and are open to seeing what type of mattress they think will suit you, you may be happily surprised. They managed to take two people’s individual sleep preferences and manufacture a mattress that has kept us both happy, cool and comfortable. I am currently in the process of returning my Tuck. I LOVE reprieve cover, the memory foam feel/quality, and how cool it sleeps, but the mattress they built for me is too firm. I’ve woken with sores and pains everyday but they would go away as I and mattress broke in. No such luck. If I wanted to exchange it for a plusher version, it would be void the trial period. If I returned and ordered another, even a year or 20 years from now, it would NOT have a trial period. You get one trial period for your LIFETIME! I have never seen this with another bed in a box company. Some of them have limits, like Brooklyn Bedding gives one trial period per year. The Tuck mattress is very well made, especially in contrast to the price of the Sapira. I think it’s worth giving it shot if you don’t know what you like or need, but if it’s not for you, RETURN it. The exchange policy is for the birds!!! The quiz doesn’t even ask the sleeper’s firmness preference anymore. It bases it on your weight. Tuck would have made my mattress even firmer if I didn’t insist I like a medium feel. The info about one trial period for life isn’t on the website, I wanted to let people know. Based on this site and several others giving good reviews of the Tuck mattress, we ordered it. It’s been two weeks now and we still can’t get a good night of sleep on it, it is literally torture. My arm goes to sleep before I do, we wake up sore and stiff. The top layer is soft but we fall right through that to a hard surface, I weigh 140 and my husband weighs 155. Maybe the mattress is comfortable for some people, but it’s not working for us at all. 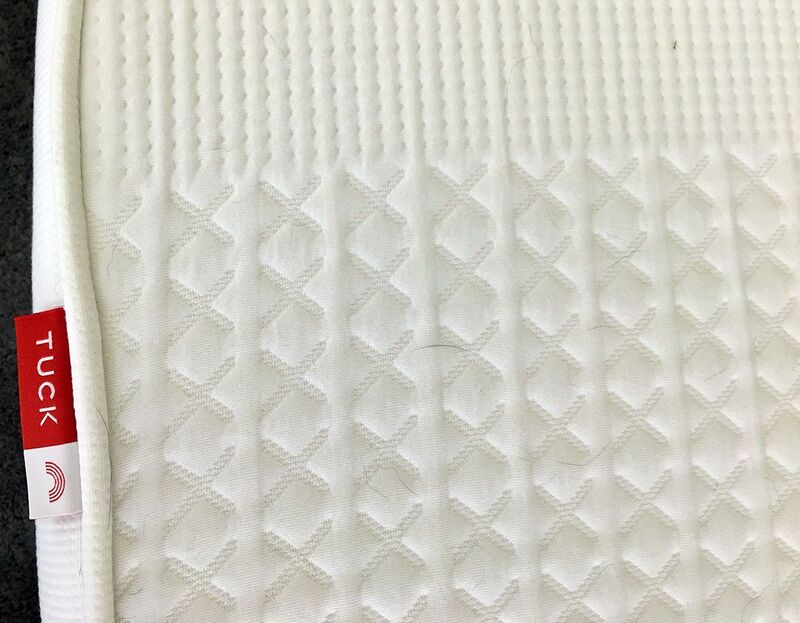 We have communicated our issues to Tuck, they sent a mattress pad, (they call it a topper, I call it a mattress pad/cover it is no different than the ones I have always had), it was no surprise that it doesn’t help. We have been told we must endure 30 days of this before beginning the return process…… I guess soon we will find out exactly how well they honor their return process but must endure another two weeks of torture first which is really frustrating. How would you say this mattress compares to Helix, the other (possibly more well-known?) “custom” mattress-in-a-box option? Very similar concept. I would just take a look at the individual components and compare from there. For example, Helix uses poly foam in the support layer, while Tuck uses pocketed coils.